On Friday 25th January, Lisson Gallery will host a special in conversation event with Chinese artist Liu Xiaodong, accompanied by Zhang Ga, Director of Chronus Art Center in Shanghai and co-curator of the current Guangzhou Triennial. The discussion will focus on the creation of his live painting machine, surveillance culture and Liu Xiaodong's forthcoming exhibition, Weight of Insomnia. 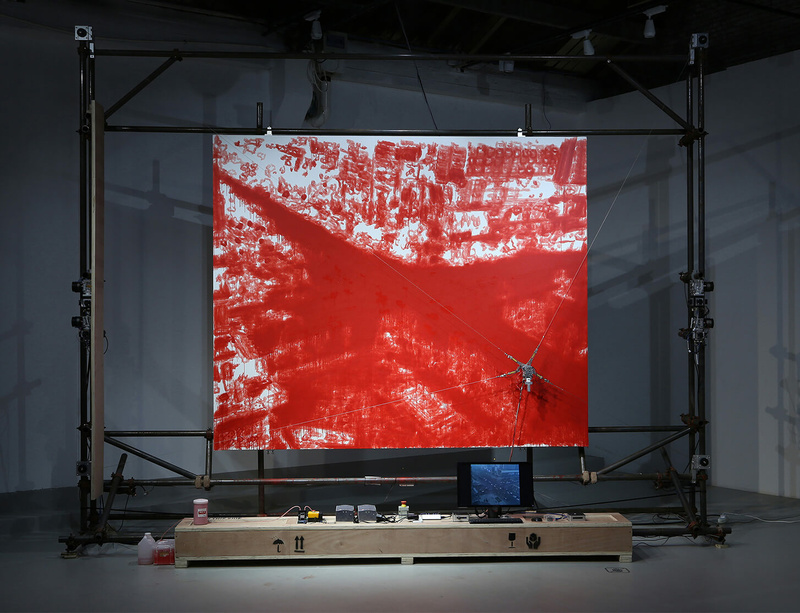 This series, collectively entitled Weight of Insomnia, has been produced with the expertise of (among others) Fito Segrera, an artist, technologist and Head of Research/Creation at the Chronus Art Center in Shanghai, where the first paintings appeared in a show curated by Liu’s long-time collaborator and friend, Zhang Ga. There they built a scaffolding tower on to which is mounted a plain canvas and a robotic brush held aloft by a network of wires that pull and push the pigment across the surface, dependent on the images being fed through the computers and screens stationed below. Far from a jerky, machinic gesture, Liu sought a painterly sensibility in his digital proxy, albeit one he has no further control over apart from choosing the location and paint colour. So far the painting machine has been trained on intersections and busy byways, capturing vehicles, pedestrians and changing weather conditions in cities such as Beijing, Shanghai, Jincheng, Gwangju, Berlin, Karlsruhe, Sydney and now, London. Please join us on Friday 25th January at Lisson Gallery 27 Bell Street, London NW1 5BY. The talk will begin at 1pm. Spaces are limited, email rsvp@lissongallery.com to confirm your attendance.